You describe the effect of "inflation" when appeared the gluon at 10^-36 sec after time=zero (piece of ice), provoking the inflation (increase of the total volume of the universe). But not only that, since the expansion was already in "action" from the start, you describe an increase of expansion on top of the actual ratio of expansion at the time. So, not only did the volume of the universe increased, but the ratio of expansion accelerated. You describe something that might explain the actual acceleration of the expansion of the universe that is observed. We just must not forget that the farther in space you observe, the farther in time you observe. In fact, in regard to your explanation, the acceleration of expansion would be provoke at the moment of maximum formation of stars, planets, etc. It's a wonderful path to explore! It's like what they try to show on this grid but without depression (downward bending). I agree with you regarding the "depression". Furthermore, the grid is not "stretched" like shown here; the grid gradually decreases in size toward the center of the Earth. So if we ad layers of that grid, one on top of the other to contain the Earth (because Earth occupy space, it doesn't replace it), then you get an exact description of a space-time deformation (decrease of metric toward the center of gravity). 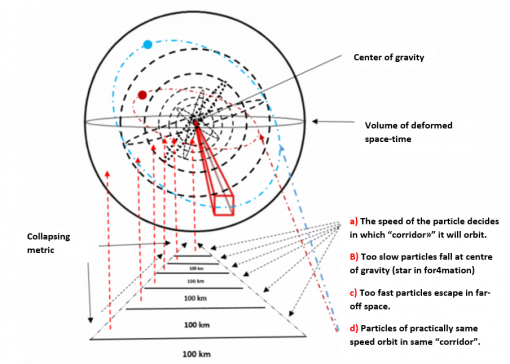 I initially introduced Variable Space-Time Density on my very first post here. Since then I have refined it to Variable Planck Scale. The true curvature of Space-Time is a scale/density gradient at the Planck Scale. Planck Cells are smaller nearer a Black Hole than in a Cosmic Void. Look at the Cosmological Model. Starts out rapid Inflation of like 50% the size of the Universe in a few seconds.. then it tapers off almost linear as distributed Matter appears and stunts the Growth of the Planck Scale.. then as Matter concentrates in Stars and Galaxies, the Universe starts to inflate rapidly again, but mostly in the near empty Voids. It's not Dark Energy, it's Planck Scale Growth in the Voids with less limited constriction due to low Volumes of local Matter in said Voids. it’s impossible to have decreasing and increasing metrics in the same volume of space-time. Your example doesn't give decreasing and increasing metrics in the same volume of space-time. You get one volume decreasing (where the ice is) and increasing where "stretching". Your example is the same as if I said that the universe is a volume of space-time where we find expansion and gravity. At least that's the way I see your example. we have to understand that when the gluon “jumped” into our universe, it came with its own “space volume” of 10^-33 meter. It wasn’t “using” the space already present. So the space itself that was “present”, was not “expended”. On the other hand, the total volume of space “present at the time”, (wich was at 10^-15 meter) was “magnified” by the new “added space” composing the appearing gluon. This gluon was coming from “out of our space-time”; it was coming from “Planck’s era”. Sorry; that first gluon was not a "volume"; in fact the gluon was a "surface" of 10^-33 meter. "Ladies and gentlemen, we have detected gravitational waves. We did it,"
But let's see where those "detected" waves came from. Two black holes merged 1,3 billion years ago. They provoque gravitational waves that moved toward us at light speed. Which indicates that the "merge" happened 1,3 billion lightyears away from us. Gravitational waves are "ripples" made in the "fabric" of the universe as wave made by à roc falling in water. Those "ripples" are made by the gravitational force that "contracts" space-time. What happens to them when they enter space-time, where expansion is greater than gravitation? Expansion "expands" space-time; so normally, it "straightens" space-time where it is "rippled". And, if so, there is no way that we can detect those ripples after they went trough "expanding space time". But then, I could be wrong. On the other hand, this is not the only question regarding this discovery. Andrex wrote: What happens to them when they enter space-time, where expansion is greater than gravitation? Just as expansion over vast distances causes red shift of EM waves, it would be expected, to do the same to gravitational waves. At separations so great that the recession rate equals universal speed limit c, an event horizon is defined, beyond which is "irrelevance". "At separations so great that the recession rate equals universal speed limit c, ..."
Are you comparing "rate" to "speed"? Re: I feel the need for ... "rate". Andrex wrote: Are you comparing "rate" to "speed"? When two locations in space are so widely separated that the local gravity of each is insignificant to the other they will recede from each other with cosmological expansion like two dots on an inflating balloon. The locations don't have a speed any more than the dots on the surface of the balloon. So, the term given to the degree that their separation grows is "recession rate" not "speed". Both are measured in distance/time (e.g. kilometers/sec.) so the recession rate can be compared to a speed. Since the recession rate is not actually a speed, it is not subject to universal speed limit c. Thus, it is possible for two distant locations in space to recede at greater than speed c.
Regions such as these are beyond communication or any conventional causality. They have an event horizon between them as real (or more so) as those which surround black holes. Items which fall into a black hole still exert gravitational influence beyond its event horizon. That would not be the case for objects beyond a cosmological event horizon. That's why I used the term "irrelevance". Thus, it is possible for two distant locations in space to recede at greater than speed c.
It "recedes" faster than lightspeed when observed at such distances; but in reality, it expands at the normal expanding "rate". I think that we agree. I agree on this; but there could be a debate on it; since speed is a rate at which an object covers distance. We don't have to wait to cover 100 km, or wait an hour, to know the speed of 100 km/hr; the "hour" or the "km" are only "relations" to the speed. So in a relation of a distance of one megaparsec and one second, the "speed" of expansion is 68.9 km. On the other hand, the travel is not made by something that is part of the megaparsec; it's the "hole megaparsec" that expands at 68,9 km. which is a "rate" and not à "speed". But; what of the first two inches around our megaparsec? Does that "two inches" recede from the center of our megaparsec at the speed of 68.9 km? I don't think so; in this case, at first glance, its speed should be 34,45 km. However; coming back to the "ripples" I was talking about, the problem was: Can those ripples be detected after crossing expanding "flat" space? Take note that I am using the "official" example (ripples) to oppose the announcement of that discovery. This "official" explanation is based on the notion of space-time being a "flat tissue". The reality is something else. Space-time is not a "flat tissue"; it's a "flat topology"; which means that it has a "tridimensional flatness"; in other words, it's "flat" whatever direction you're traveling; so it's "flat" whatever, in fact: in all directions it's expanding. Gravity doesn't "make a hole"; gravity is the result of the successive collapsing of the "metric" of space-time. The nearer you get to center of gravity, the "smaller" is the metric. There is no "ripples" involved because there's no "flat tissue" involved. When two blakholes merge, the intensity on "collapsing" metric increases; and since you can't have a greater collapsing of something that is completely collapsed (center of a blackhole), the volume of collapsed space-time of the resulting balckhole is far more bigger than any of the two previous ones. I don't think that it has any influence on something that is 1,3 billion lightyears away seperated by "flat topology".. If we go a little further in our description of merging blakholes, we can imagine that at the moment of the merging, a reaction is provoked (which is exactly what the new discoverers implie). But if we do that, we accept that before the merging, there is no reaction. Which brings us to the problem of the gravity of a galaxy including the mass of orbiting stars around its center. If the "reaction" increasing the volume of gravity takes place when the two blackholes merge into one blackhole, it means that the gravity of a galaxy is not affected before a star makes contact with the center of that galaxy. So the mass of orbiting stars in a galaxy doesn't increase the déformation of space-time of that galaxy. And we are back to all my previous comments. Andrex wrote: it expands at the normal expanding "rate". I think that we agree. Good, so long as we agree that expansion rate is proportional to separation. The further two locations are apart, the faster they recede from each other. Andrex wrote: Can those ripples be detected after crossing expanding "flat" space? Light is detected across expanding space (so long as recession < speed c) but it is red shifted as a result. Gravity is expected to be lightlike (propagating at speed c), its waves should be expected to red shift as well, but still be detectable. Andrex wrote: Space-time is ... a "flat topology"; ...a "tridimensional flatness"; ...in all directions it's expanding. Yes. It's fine to think of space as a 3-surface, to which time is perpendicular at all points. The 3-surface is at least locally flat, a 3-plane. Andrex wrote: When two blackholes merge, the intensity on "collapsing" metric increases; and since you can't have a greater collapsing of something that is completely collapsed (center of a blackhole), the volume of collapsed space-time of the resulting balckhole is far more bigger than any of the two previous ones. I don't think that it has any influence on something that is 1,3 billion lightyears away. I agree that when two black holes merge the event horizon increases its radius (from an external perspective). The ripples (gravitational waves) result from the process of the two spiraling inward. If two stars are observed (edge on) merging like this, ripples in their light intensity are detected. The frequency of the changes increases as they spiral closer and closer, increasing their rotation rate. The same was predicted for gravity. Andrex wrote: merging blakholes, we can imagine that at the moment of the merging, a reaction is provoked (which is exactly what the new discoverers implie). But if we do that, we accept that before the merging, there is no reaction. Take a bath (with bubbles)! Agreed, when two large bubbles merge (like event horizons of black holes), they effect the rest of the foam. But if those bubbles could be pushed around in a spiral beforehand, it would also effect the rest of the foam (wavelike). If two stars are observed (edge on) merging like this, ripples in their light intensity are detected.The frequency of the changes increases as they spiral closer and closer, increasing their rotation rate. The same was predicted for gravity. That's where the problem is; in a collapsing space-time volume, there can't be "waves" or "ripples". And even if we see two volumes of collapsed space-time approaching each other, spiraling inward, those two volumes don't disturb flat space-times topology around them because the "power" of expanding "flat space-time" is greater than the "power" of the gravity of the colapse space-time. That is, if the universe is made of two kinds of space-time, independent of each others: 1) volumes of "dispersing space-time" and 2) volumes of "focalising space-time". Just as we've seen it in the results of Planck's satellite. Whatever was imagined before what we observed becomes "irrelevant". If you look at the drawing representing the two blackholes spiralling inward, you'll see a hole underneat each black hole which makes the waves. That is not the case because there's no holes underneat à blackhole. Space-time deformation of our Solar system is not situated underneat de sun; it's near the center of gravity of the sun. Like I already said, it's not a "hole"; it's only a different métric in that volume of space-time. Light is detected across expanding space (so long as recession < speed c) but it is red shifted as a result. Light is detected, you are right; but light is not à “ripple” in the fabric of the universe; light is a particle/wave of a quantum of energy. Ripples in the fabric of the universe cannot be waves of energy since gravity is not energy; gravity is only a topology that curves trajectory; not by “force” but simply by the deformed structure of space-time structure (the deformation of its geometry). So its waves can’t be expected to redshift because it’s not energy (furthermore, there can't be such gravitationnal "waves" predicted one hundred years ago or not). The 3-surface is at least locally flat, a 3-plane. In fact, it’s the “interior structure” of the whole volume of space-time that is “flat”. The metric everywhere inside the whole volume is exactly the same. An example would be soldiers all six feet tall, standing at the same distance of each other on a parade square; you get straight lines formed by the soldiers everywhere on that parade square and that is only a 2 dimensional picture. To get a 3 dimensional picture, if you have 50 soldiers on each sides of the square, you have to add 49 more squares of soldiers on top of the first one (50 soldiers large by 50 soldiers long by 50 soldiers high. all 6 feet tall); and you will still get only straight lines in all 3 dimensional directions. That's what looks like the metric of a volume of "flat space-time". If you want an idea of a déformation of space-time, use soldiers being from 4 to 6 feet tall and place them the tallest toward the sides of the square. Then the lines that they will form will be 3 dimensional "curves" (curving toward the center of the volume). And it took one hundred years to finally find something to measure, that we can use as a proof of that « prediction ». Too bad for the "prophet", that gravity cannot be a “wave/particle” that would be a quantum of energy. If you look at the "block" of 50 soldiers, 6 feet tall, you cannot identify only 3 "planes" (surfaces); because which ever way (angle) you look at the block, you will see a " flat plane" on all 360 degrees you look. So, in a volume, you don't have only 3 "surfaces" anymore. And if you transfer the soldiers to be "original points" (volumes of 10^-15 meter) which composes the volume of our universe, you'll get an "infinite" number of "surfaces" (planes). Since it’s more difficult to “see” that ripples in space time doesn’t disappear when traveling through flat expanding space-time, let’s see what happens when traveling through curved “collapsing” space-time (gravity). So our “ripple” in space-time approach (at lightspeed) a space-time deformation (volume of collapsing metric of space-time). When the “ripple” enters the deformation, its own metric starts to “collapse”; by the time the ripple reaches the black hole, the ripple has disappeared. So if our “ripple” is affected by "collapsing" space-time; it's also affected by “expanding” space-time. Collapsing makes it disappear and expanding makes it “smooth” enough to also disappear. Andrex wrote: in a volume, you don't have only 3 "surfaces"
True. But given an ordinary plane, there are two more, mutually perpendicular (orthogonal) planes. In the same way, a volume is most simply defined by three orthogonal coordinates. By "3-plane", I refer to a way of representing a 4th dimension, such as time, by depicting the other 3 dimensions compacted into a flat surface. A circle drawn on a 3-plane corresponds to a spherical surface. On the right, a single temporal coordinate (T) is shown perpendicular to a spatial 3-plane (XYZ). 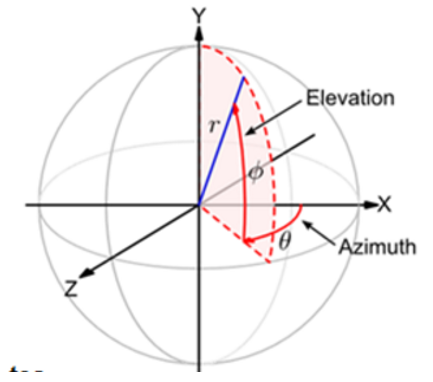 Rotation in a 3-plane entails both angles (Φ & θ above) required in spherical coordinates. This corresponds to a single solid angle range of 4pi steradians. Great drawings! Thank you Faradave. They are going to be of great help. I agree; defining à perfect spherical volume needs three orthogonal coordinates. But in the reality of any sphere volume, you get a plane at each 360 degrees (in fact all fractions of degree) around the center of the drawing of your "3D Sphérical coordinates". 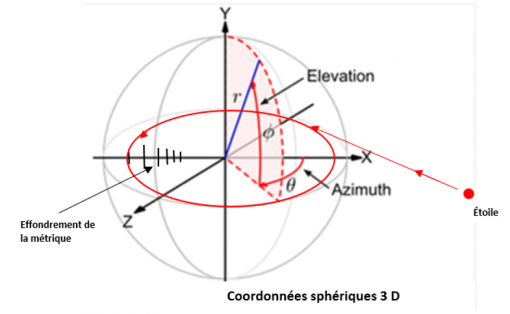 Furthermore, if you imagine that 3D sphere collapsing gradually toward its center, you will not get à "depression" of your plane (a hole). You will simply get a contraction of the "plane" and so, of the complete sphere which will augment its density. There won't be any "ripples" involved in any of the "planes" at any degree observed. Andrex wrote: 3D sphere collapsing gradually toward its center, ... You will simply get a contraction... of the complete sphere which will augment its density. There won't be any "ripples"...At least that's the way I see it. I think that's a fair assessment. If an asteroid orbits a massive star which subsequently collapses into a black hole, provided the asteroid is not directly impacted by ejecta from the collapse, it's orbit should be stable about a fixed center of mass. It starts and stays a two body problem. But an asteroid orbiting a rotating binary star system, is a three body problem, subject to chaos. * That instability be explained by the changing spacetime curvature (ripples) that the asteroid experiences. This is worsened if the binary stars are on a spiraling collision course. After they combine, perhaps the asteroid can settle down. For spiraling black holes as well, it's like two bubbles of contracted spacetime, in a collision spiral, which ends up with a single larger bubble (sphere). From above the plane of the spiral and at a distance to see gravitational lensing, the recent depictions look like this (video, 55 sec. in). Ripples in spacetime might be visibly detected as spiraling gravitational lenses, if we could record over cosmological times and distances (shown). As it is, we settle for the last, fraction-of-a-second "chirp" from LIGO. *"In 1887, mathematicians Heinrich Bruns and Henri Poincaré showed that there is no general analytical solution for the three-body problem given by algebraic expressions and integrals. The motion of three bodies is generally non-repeating, except in special cases." P.S. The more elegant parts of my images are usually imported from other sources, such as Wikipedia, in my last post. On your last picture, Faradave, what we see is two "bubbles" of collapsed space-time (which are not "holes") and ripples are nor seen but "added" to the picture. So what I did is take the drawing you posted showing the 3D spherical coordinates. We agree that this sphere represents the collapsing of a volume of space-time (I hope). We also agree that the velocity of a star determinates where this star will orbitate after entering this "bubble" (I still hope). So I drew an entering star and placed its orbit around the center of gravity of the "bubble". My question was: Is this star, orbiting inside the "bubble" provoke the spinning of the bubble? and my answer is: No; not at all!. Because the star is exclusively "following" the path (trajectory) désignated, in front of it, by its velocity. Just like horses on a race track follow the race track. They don't provoke the spinning of the race track. Afterward, I placed a multi thousands stars (galaxy M 31) inside the same "bubble". They all orbited around the center of gravity of the "bubble" and they didn't make the "bubble" spin either; they just followed, individually, the path désignated by their proper vélocity. Even if the galaxy seems to spin, the space-time occupied by the stars of the galaxy doesn't spin. There is no réaction, whatsoever between the orbiting stars and the "bubble" of collapsed space-time. Exactly like there's not réaction of the race track to the galloping horses. So this shows that the "bubble" (space-time) containing a galaxy doesn't spin; it's only the stars that orbit around its center of gravity. So then, how can a "black hole" spin? It's only a volume of collapsed space-time. Let's try now the merging of two "bubbles" like your 3D spherical coordinates. What's going to happen, during the merging, is a "tidal effect" that I described previously (page one; drinking glasses). This "tidal effect" will be between and inside both "bubbles" and nothing more. When the two center of gravity merges into one, the volume of both "bubbles" will merge into à greater "bubble" and ...that is all. It won't even affect the volume of the universe because if you add two existing volumes to produce one single volume inside a greater volume, the total volume doesn't change. Furthermore, a volume of collapsed space-time doesn't emit energy; it captures matter. Only in the case of a black hole, there's emission of energy perpendicular to the plane occupied by orbiting matter and not by the plane of the spinning black hole. How can "ripples" be justified in all these "facts"? I can't see any justification. I hope I'm wrong; but I doubt it very much. -And yet it rotates! Would say Galileo. -But it doesn’t; I tell you. And Galileo was talking about the Earth; not a galaxy. -Then prove me that a galaxy doesn’t rotate. -Ok; here goes! You know that a galaxy contains stars orbiting around its center of gravity; right? -You also know that it keeps its orbiting stars because of its space deformation’s geometry; or space-time deformation if you prefer. -As a matter of fact, I prefer. -So here is a drawing representing a volume of a deformed space-time that could contain a galaxy. Here we’re considering only the volume of space-time without the matter that could “occupy” that space-time. I hope that you agree that “occupying” space doesn’t mean “eliminating” space? -Nice; but I think I saw it before. -You probably did cause I stole it. But even so, this volume of deformed space-time doesn’t rotate; it’s only a volume of space situated somewhere in the space-time universe which doesn’t rotate either. This volume of space-time is simply formed by the gradual collapsing of its metric down to its center of gravity; whatever causes it. You agree? -What we’re going to do, is make a star get inside this deformed space-time. -You do it. I’ll look. -The speed of the star will define the orbit it will adopt around the centre of the galaxy. I had to make three attempts. The first star wasn’t going fast enough and fell at the center of gravity, the second star was going too fast and it came out of the deformation and I lost it in the far-off space. But as you can see the third one placed itself in orbit. -Tell me; does this star provoke the rotation of our space-time deformation? -Certainly not! It only follows the geodesic indicated by its speed. We can say that it thinks going straight ahead but since the space-time is deformed, its course is curved; so its “straight ahead” places it in orbit. -Bravo! Now I’m going to place billions of stars inside our volume of deformed space-time. -It’s your volume; not mine. -Hey! That’s galaxy M 31. -Right; but my question is: does, now, our volume of deformed space-time rotates? -It doesn’t rotate more than when you inserted your first star. All the stars of M 31 orbit individually around the center of gravity in relation to each its own speed. -So a galaxy doesn’t rotate and that’s what you asked me to prove. -I admit that you’re right. -Being right is not important. What’s important is to understand that a galaxy doesn’t rotate even though scientists talk about rotating galaxies. It seems to rotate but that's only because each stars orbits individually around the center of the galaxy. The diagram shown represents only a spatial volume (3D) not "space-time" (4D) and not "deformed spacetime". The curves shown are not gravitational, they represent spherical coordinates (r, θ, Φ) superimposed on Cartesian coordinates (X, Y, Z), which are interchangable. Andrex wrote: This volume of space-time is simply formed by the gradual collapsing of its metric down to its center of gravity; whatever causes it. You agree? Nope. I don't understand what you're trying to say. This is not a black hole. Ignoring frame dragging, given that spacetime doesn't rotate is not the same as a galaxy not rotating. It's particles on average orbit the galactic center, appearing to move through space over time. Who said the coordinates had to rotate in order for the galaxy to rotate? This ignores the gravitational interaction between nearby particles (e.g. stars). One can't move "independently" without effecting its neighbors. Did someone tell you galaxies rotate as a solid disk? Next you'll be saying stars don't rotate either. The gas particles just happen to be individually orbiting it's center of gravity. I don't see your point. :-) Since the 4th D cannot be drawn I had to limit myself to 3D. So if you prefer, the drawing represents a volume of space that can contain a galaxy. Furthermore, I can't imagine space having no time. Gravitation is a consequence of the deformation of the space-time's geometric. 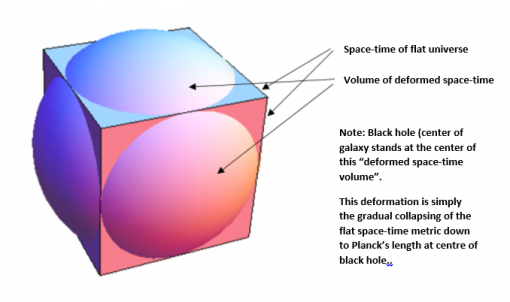 A black hole is the maximum déformation of space-time's geometric. But black holes are not the only volumes of space-time that are deformed; all massives particles deform space-time even quarks. Whichever volume of space-time that is not "flat", is a volume of space-time that is "deformed" geometrically. And that volume of deformed space-time has the consequence of gravity. If you take the volume of the deformed space-time around the sun and you take out the sun, you get a spatial volume of space-time deformed way down to the center of gravity of that volume (a black hole which its sun is eliminated is the proof of that). Like I said, matter doesn't "eliminate" space-time; it "occupies" part of it. Take out (or don't consider) the matter and the space is still there; which means that the space occupied by the sun of the exemple is deformed way down to the center of gravity of that space occupied by the sun. Who said the coordinates had to rotate in order for the galaxy to rotate? I'm not talking of the coordinates; I'm talking of the whole volume of deformed space-time (the space-time balloon containing stars etc.) wich gives the geodesic to whatever object (matter) that moves inside it. The object cannot "drag" space-time when it just follow the geodesic determined by its speed. That geodesic, wich produces a curved trajectory, is the consequence of gradual collapsing metric inside a volume of deformed space-time (the basic metric of space is 10^-15 m). I explained that already on another post. This ignores the gravitational interaction between nearby particles (e.g. stars). Which are tidal effects that approaches together the center of gravity of some of the nearby stars; but there's no "attraction" involved. Only slight deviations in their orbits (wich I also explained earlyer with the drinking wine glasses). Did someone tell you galaxies rotate as a solid disk? What does mean "rotating galaxy", if not? 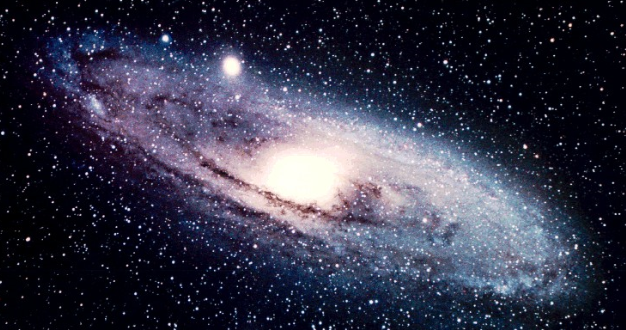 A galaxy is a volume of space-time that contains matter (stars, planets, etc). And all that matter orbits individually around the center of gravity of the galaxy. Take half of the stars of a galaxy and the remaining half is going to keep on orbiting around that center of gravity at the same speed and the same orbit anyway; because it's their individual speed that decides each their orbit; nothing else. Just like our man made satellites around the Earth. Next you'll be saying stars don't rotate either. Would I say that really? Didn't I explain previously how and why stars and planets rotate? I'll check and come back to you on this. Where does rotation of planets comes from? The gas particles just happen to be individually orbiting it's center of gravity. I don't see your point. The gas particles are orbiting individually around the center of gravity of the galaxy; just like the stars. Let's say that if I would say that a galaxy is a bunch of stars stuck together, i'd have to accept that a galaxy rotates; but, to me, a galaxy is rather a volume of space-time that is deformed and so, has the consequence of keeping moving matter (stars, gas, whatever) inside its volume depending of the speed of the matter.Too slow, it goes to the center of gravity; too fast, it goes far away in space-time. As you can see, in order to have a "flat universe", déformed space-time as to be local; not universal. Last edited by Andrex on April 4th, 2016, 9:39 am, edited 1 time in total. I wanted to correct grammatical and the post doubled itself; so I erased it. Sorry. Our previous posts was regarding the events inside a galaxy; they follow the same process as inside the formation of a star system (its planets). The following image is of HL Tauri approximately 450 light-years from us. 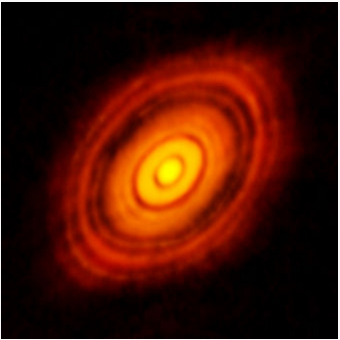 It shows the formation of planets around that star. That is the same process we were talking about previously. This process occurs inside the “balloon of deformed space-time” shown in previous post. The "balloon" being a galaxy or a star formation. As you can understand, there are "balloons" inside bigger "balloons". This is what I think happens inside this "balloon". And I don't think the process makes the "balloon" rotate because "space-time" cannot be "physically" dragged. An analogy would be your national anthem; it exists even if you're not singning it; and you cannot "ear" it without singning it. Space exists but you cannot "see" it without distance between objects (which makes it sing). If there's no objects (at least two) you cannot "see" space (space-time). As a matter of fact, distance and time are the two faces of the same coin (space-time). And if I may add to discrepancies, since galaxies nor star systems rotate, there's no "centrifugal effect" implicated in them like the one observed regarding Earth's rotation (used to help send spacecrafts). I guess I'll have to, soon, explain how planets forms themselves and where the "accretion" of their particles happens in the "corridor" they orbit. That explanation is also personal and could be "off track", naturally. We'll see when I present it. Re: Is its "volume", part of a galaxy? Andrex wrote: Since the 4th D cannot be drawn I had to limit myself to 3D. That's fine. 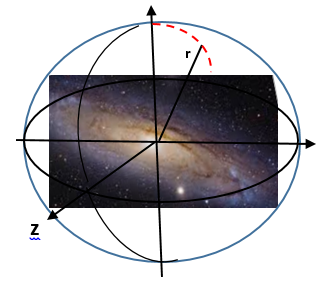 You can consider a spiral galaxy as essentially flat, occupying an XY plane. Then ignore the Z spatial axis, replacing it with Time. Each object in the galaxy will have a world line which spirals about time as it progresses, like the coil of a spring. You might find Newton's Shell Theorem interesting. As the center of a star is approached, pressure indeed goes up, but gravitation actually decreases, to zero at the center. Quite different than approaching a black hole. This can be applied to 2D rings considered for of a flat galaxy. Andrex wrote: A galaxy is a volume of space-time that contains matter (stars, planets, etc). And all that matter orbits individually around the center of gravity of the galaxy. I think its just a difference in how we each define a galaxy. I see it as a collection of objects moving through space over time. In spacetime this is a collection of worldlines, spiraling forward in time about the galactic center, a "rotating" galaxy. In spacetime, the worldlines don't actually move, they simply aren't parallel to time. Either way, I don't see space moving with the galaxy. When balls roll on a rubber sheet, their deformations move with them but the rubber sheet "continuum" stays generally in place. So we agree; the space-time of a galaxy doesn't rotate; but if we consider only de flat disc made by the orbiting stars, etc, it makes seem like the galaxy is rotating. You might find Newton's Shell Theorem interesting. As the center of a star is approached, pressure indeed goes up, but gravitation actually decreases, to zero at the center. I have for a long time :-). Newton saw gravitation as "attraction". If you consider gravitation as a "volume of deformed space-time", the smaller the volume considered (the closer you get to center), the less gravitation (decreasing metric) you get. And it goes way down to "zero volume" where you get "zero gravitation" (zero metric). But the pressure, like you said, increases simply because matter particles are pushing to get to the center of gravity. The more particles pushing, the more "pressure" you get . It's quite simple to understand in fact. Quite different than approaching a black hole. You're talking inside the black hole's horizon. But before getting to that horizon, it's exactly the same as approaching a star. As for inside the star itself, I guess that if you eliminate the matter, you'll get the same event as in a black hole. Anyway, nobody knows for sure what happens inside a black hole's horizon. I agree. 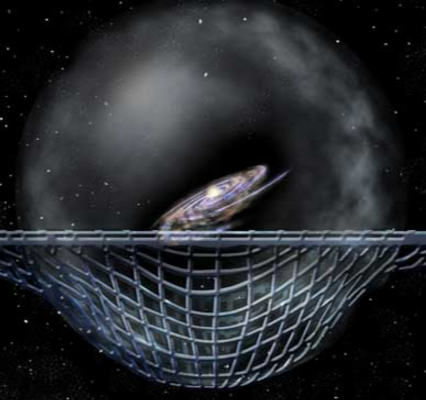 Personally, I see a galaxy as a "balloon" of deformed space-time's geometric "suspended" in expanding 3D flat space-time. In my mind, whatever it contains materially is almost irrelevant in regard to space-time. To me matter is condemned to follow the center of gravity of the space-time deformation. From what I understand, in your mind, I think that you see the matter dragging the deformation trough space. As I see it, your point of vew is in regard to moving matter; mine is in regard to expanding space-time. As you can see the "balloon" of deformed space-time is a lot greater than the galaxy. We will (at least we should) all agree that our universe, at the present moment, is an electromagnetic universe. The first question is: Has it always been an electromagnetic universe? And the answer has to be: No it hasn’t, since the actual universe is the product of an evolution. The second normal question would be: Since when has our universe been electromagnetic? And that answer has to be: Since the appearance of electromagnetism, when gamma rays manifested themselves. 3rd question: When was that? Answer: We know that when a particle collides with an antiparticle, it produces photons. The most energised photon that exists is a gamma photon. So there cannot be any electromagnetism before the presence of particles and antiparticles producing gamma photons. And we know that those pair of particles appeared right after the “insertion” of the gluon into our universe, when it had expanded to 10^-15 m.
We saw that this “insertion” started “inflation” at 10^-36 sec. We also know that the shortest length of the gamma rays is 10^-14 m. So we can, now, situate the appearance of electromagnetism at the beginning of inflation, at the moment when happened the first decay of Top and antiTop quarks; which would be around 10^-35 sec after time = zero. So those most energetic pairs of particles produced the most energetic photons, the gamma photons. We also know that the collision of two gamma photons produces a pair of electron-positron. The appearance (or production) of the electron has to follow the same principle we saw for the appearance (or production) of hadrons. Its mass describes the chronology of its appearance. So the tau lepton, which is the most massive, came before the muon, which preceded the normal electron. After the gamma rays, appeared the X rays which have a length between 10^-11 m and 10^-8 m who were followed by the U.V. rays (black light). There are three kinds of U.V. light: UV-C ray has the shortest length and is the most energetic. UV-B has medium length and UB-A is the ray that has the longest length and is the less energetic. This period of electromagnetism is called the “dark ages”. As you can see the principle of “creation”, I should say “production”, in the universe is always the same, which follows the surrounding density of energy to equilibrate itself (1 = 2/2 = (4/4 – 1/1 = 3/3) 1/1 being an energy quanta ejection). In fact it is always and only a "transformation" of the intensity of its energy following the decreasing density of the environment. The following “moment” in the history of our universe is the “appearance” of visible light. Which correspond to the astronomical event of the freedom of photons; when our universe became “visible”. Which means that we could now “see” electromagnetism as shown by the photo of the cosmic microwave background radiation; in other words: we could see the electromagnetic spectrum in its visible light portion. Then followed Infrared, Micro and Radio wavelength. We can observe that the drawing represents the expanding of the electromagnetic wavelength. Which tells us that electromagnetism responds to the expansion of the universe. In other words, the wavelength of electromagnetism is “attached” to the “expanding metric” of the universe since the appearance of electromagnetism. Which also gives us a characteristic of the “tissue” of the universe at the present time. My earlier proposition of (I hope I did propose it here, if not, here it is) the universe being a “single big photon” is kind of confirmed by this electromagnetic fact. Note that the above mentioned (1/1) energy that is ejected to attain equilibrium, is an energy “quanta” (piece) of the total universal photon. So our actual universe is presently, totally “electromagnetic energy”. And all the kinds of energy we can observe with our technical “tools” is the entropy of electromagnetism. That entropy of the photon is the story of photons. So when we study the microwave background of our universe, we observe the entropy (story) of electromagnetism; or, if you prefer, the story of our universe since it became an “electromagnetic universe”. And that is why we can observe the universe in different wavelengths. Surprisingly, we can draw that story from the beginning of time = Zero, on an electromagnetic spectrum like in the following drawing. Working with that drawing should simplify research, I believe. Starting at time = Zero up to 10^-43 sec, we have “Planck’s era” where kinetic energy was produced. At 10^-43 sec, centripetal force was defeated by centrifugal force and the splitting of those two “forces” produced the Big bang. Neutrinos “exploded” in all directions creating depth added to the previous surface and gluons “imploded” back in Plank’s era reuniting in a new surface. This is the epoch when our universe became tridimensional and was a “radiating energy”. At 10^-36 sec appeared the gluon particle coming from Planck’s era. The universe had a diametric of 10^-15 m.
Between 10^-36 sec and 10^-32 sec, the decays of gluon particles produced successively all pairs of quarks/antiquarks; which provoked “inflation”. Everything was finished by 10^-32 sec. During this period, pairs of energised quarks/antiquarks collided producing gamma rays. Our universe, at that moment, became “gamma electromagnetic”. The universe, was also now added by Tau leptons, muons and electrons. At 10^-32 sec, the universe had expanded to 10^-12 m and the electromagnetism “adjusted” itself to its environment, in “transforming” gamma ray energy in X rays energy (10^-10 m). X rays were responding to the expansion of the universe. Which could prove that the “metric” of the structure (texture) of the universe itself, is now “electromagnetic”. X rays era lasted until the metric of the universe attained 10^-8 m, when another energetic transformation happened: X rays became UV rays. That last era lasted until the metric of the universe was 380 nm and the energy of electromagnetism became “visible light” (0.5 X 10-6 m). This instant was at 388 thousand years after Big bang. Please note that this is not what I “believe” to be the reality of the universe, because I don’t “believe” in anything. It is only a “pattern” that I see when I observe all the information supplied by our scientific researches. I think it would be practical to use this “pattern” for comprehension. At least it helps me. How could planets be produced? Sorry for being so long without coming. I was caught up writing a novel (three tomes) on my ancestors that first came to Canada. But even so, I’ve been reading, time and again, all I’ve written here since the start; and I can’t find nothing to oppose my viewpoint on the subject (I hate that). And since, it seems, that I cannot have help to object to it, I will try to propose something else which would possibly produce objections (I hope). The question is: How could planets be produced? We all know that planets are created by accretion of particles; but no one as explained yet, what permitted and caused those accretions (at least I have never heard of it). Gravity, by itself, should have accreted everything to the Sun; so what prevented this to happen? Let’s look at a simple fact that we know regarding orbitals of planets around the sun. I’m talking of Lagrangian points. As an example, this is the “picture” of those points created by the sun versus the heart. Note that we can also interpret the lines around objects as “space-time deformations” or “decreasing metric of space-time” which should help us. Now; if we remind ourselves of my explanation of the “tidal wave effect” where at the “junction of two glass wines merge”, we can imagine that we could stand on that single point without falling on either side of the deformation (in either glass wine). Which means that, on those points, gravity is “equalized”. Point L1 on the picture above is one of those “equalized” locations. At the L1 point, Earth's gravity becomes exactly equal to the Sun's “pull”; so that "spot" is a perfect place where “independent floating particles” can “accrete” or where a planet can grow by accretion. Point L2 is another such place where a “tidal effect” happens, and where gravity is “equalized”. But there are three other points that are also produced as shown on the picture. To make it short, let’s confirm that in contrast to L4 and L5, where stable equilibrium exists, the points L1, L2, and L3 are positions of partially unstable equilibrium. Any object orbiting at L1, L2, or L3 will tend to fall out of orbit eventually. We are now ready to "go". So let’s consider those different points and try to “recreate” the planets around our sun the way it could have happened. We then begin with a molecular cloud held together by gravitation. The center of gravity of the cloud gradually accretes molecular particles and form a “body” that will, eventually, start nuclear fusion at his center. Becoming a big “body”, it creates a L1 Lagrangian point between itself and the center of the galaxy, where particles start to accrete and produce a second “object”. This second place should be a long way from the first accreted body (future Sun). Even though it might fall out of orbit eventually, this second “ball of matter” should orbit, for quite a long time, around the centered body that first accreted (Sun), just as all molecular particles keep on orbiting around it. Furthermore, this new “cosmic object” should adopt an elliptical orbit passing near the first bigger object. But we must keep in mind that the first body (Sun) started gaining size a long time before the second one, since it had to get big enough before “interacting” with the center of the galaxy. We now have two “cosmic objects”, in succession, very far and very near from each other, with one orbiting around the other; and both continue to gain size by adding particles in regard to their personal gravity. These two objects create another L1 point between them which is a lot closer (when near) to the biggest cosmic object (future Sun). The next “planet” gets then formed very near to the first big object. Incidentally, astrologists observe quite a big number of such events: One sun with a big planet orbiting close to it. But let’s continue “creating planets. We have now a “planet system” composed of one Sun and two planets with one of those, having a great orbit, cruises starting close from the Sun to very far from it (in fact, at the end of the Sun’s space-time deformation where a “tidal wave effect” occurs with the deformation of the center of the galaxy). We will forget this last planet for the time being and concentrate on what happens between the sun and the close orbiting planet. Those two cosmic objects produces two Lagrangian points (L4 and L5) where two other planets can form. There can also be accretions on L1, L2 and L3 but these objects will fall out of orbit and merge with, probably, the Sun, gaining then a big amount of matter or, as we already saw on previous posts, “mass energy”. This sudden added “mass energy” might be what provoke the “lighting” of the Sun (the start of fusion at its center). So what we observe now is that planets are formed, two at a time, in the solar system; and they form where L4 and L5 Lagrangian points are created between the two biggest objects of the system. 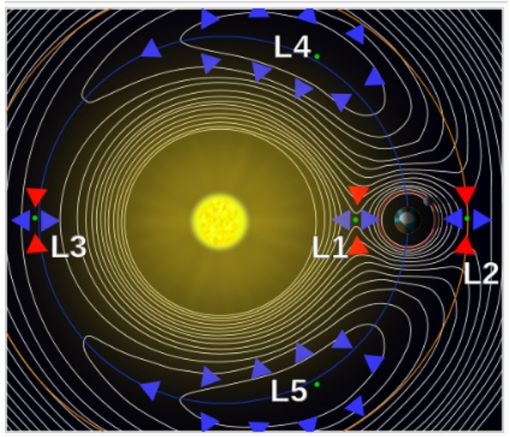 Note that L4 and L5 Lagrangian points of smaller planets can produce moons for those planets which will be on a stable orbit. It seem that the moons of planets to close to the sun have been captured by it and where anihilated (or never formed). As you can see, Lagrangian points seem able to explain the formations of planets around a sun inside à molecular cloud. a) There is (or was) a first planet formed far in space on a initial L1 Langrangian point. c) The other planets of the system are “created” on L4 and L5 Langrangian points which are the really stable orbits in a planet system. d) It's not that crasy to think that there's a planet X somewhere far from the Sun. The Lagrangian points move relative to the moving planets and are not a locked position. Matter passing through on route to some Gravity well (comets etc) are also moving. Everything is in motion. Collisions (accretion) is inevitable. But a good point is why are all the major planets on the same plane of the Solar Ecliptic. Dust and debris is 3D and so even if a Gravity Well did develop as our Sun, the Planets should have grown from this junk at many possible angles. Perhaps the Sun and Jupiter primary ecliptic may have played a role in aligning the other growing bodies on a single plane? Science doesn't have a good explanation for this feature. Wiki wrote: Most of the major bodies of the Solar System orbit the Sun in nearly the same plane. This is likely due to the way in which the Solar System formed from a proto planetary disk. There is my issue. Why a Disk and not a Sphere? Something doesn't add up. A debri cloud is isn't flat to begin with. So what flattened it?